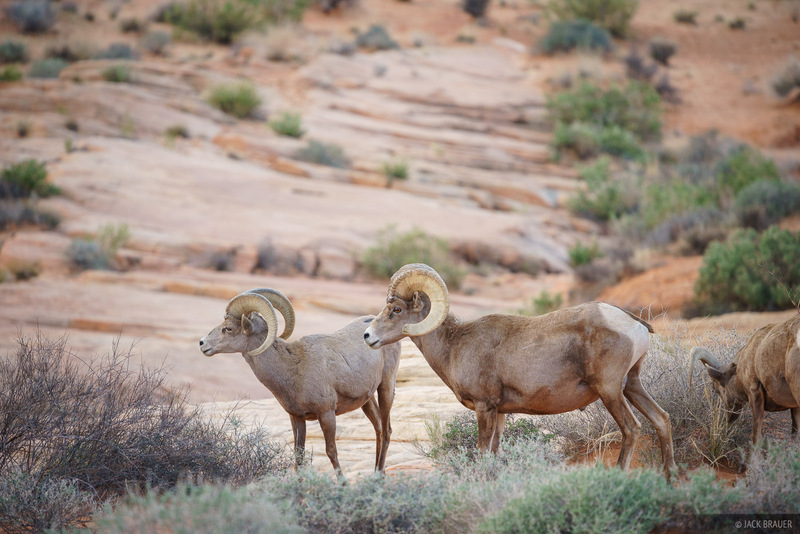 While the vast majority of visitors to southern Nevada only see the bright lights of Las Vegas, there is actually an abundance of wonderful wild desert lands surrounding the city which will please any nature lover. 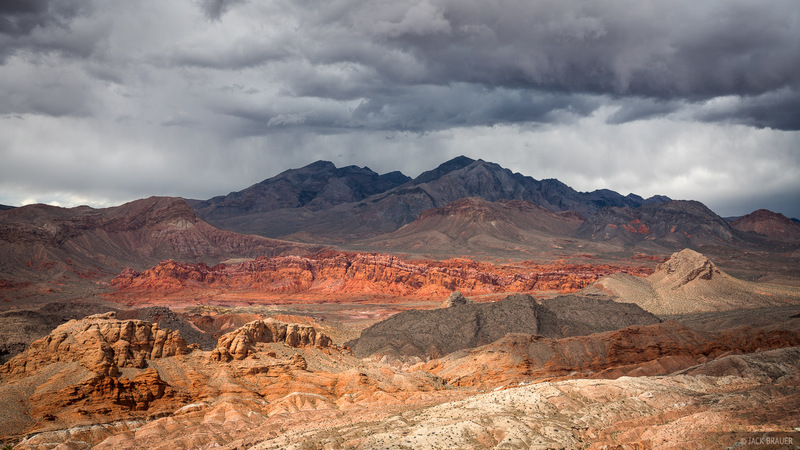 In mid-March we escaped the cold winter and spent a week camping around in the much warmer weather of southern Nevada, enjoying locations including Valley of Fire State Park, Lake Mead National Recreation Area, Muddy Mountains Wilderness, and Red Rocks Canyon National Conservation Area. 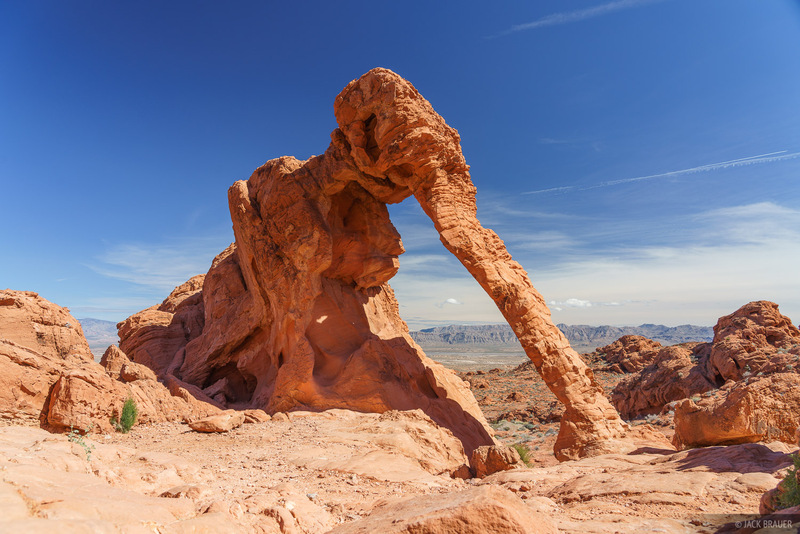 The famous Elephant Arch in Valley of Fire State Park. 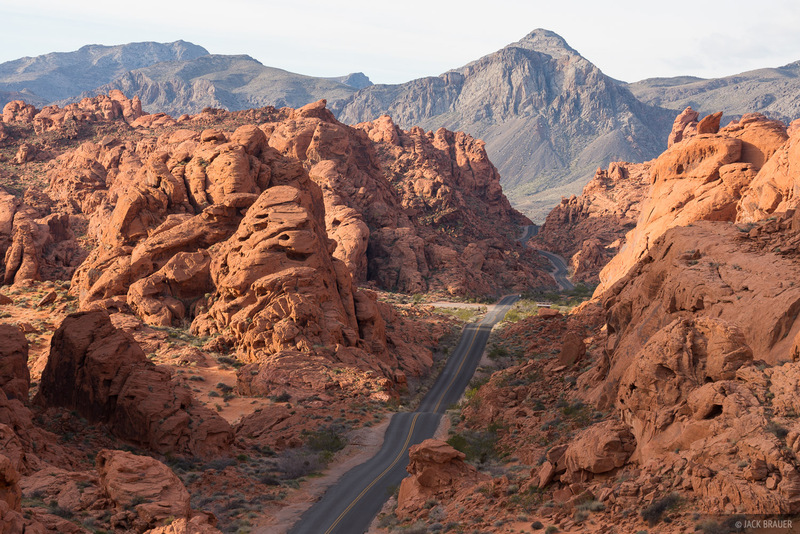 Our first destination was the famous Valley of Fire State Park northeast of Vegas. 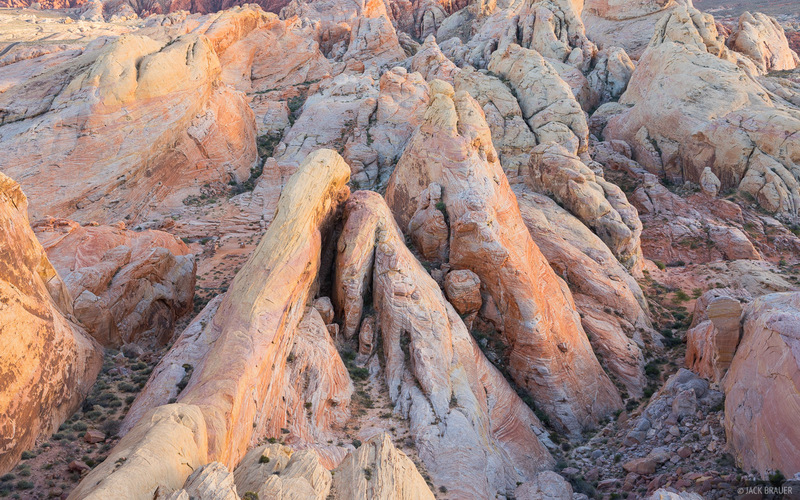 This is a small park but it is chock full of super colorful sandstone formations. What makes it even more impressive is that the sandstone pops up in the middle of the desert where there generally isn't much sandstone - as if a chunk of southern Utah emerged in the middle of the Mojave Desert! 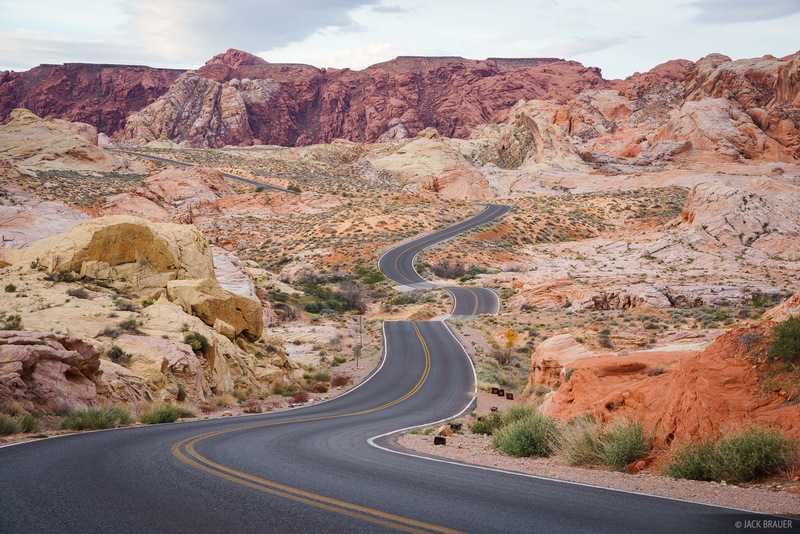 White Domes Road snaking through the colorful sandstone of Valley of Fire State Park, Nevada. We arrived in mid-morning and secured a campsite at the spectacular Arch Rock campground, then spent the day driving around the park and in the late afternoon we hiked the wonderful White Domes Trail. 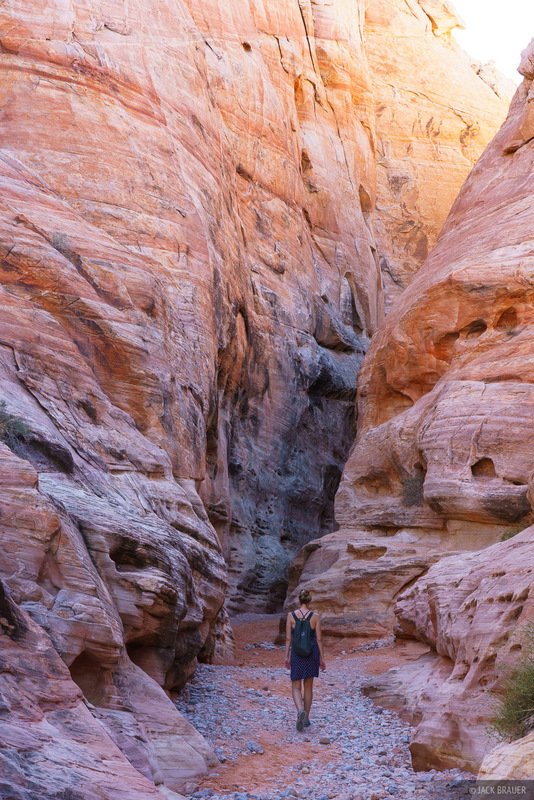 Claudia hikes into a short but sweet slot along the White Domes Trail in Valley of Fire. Evening light illuminates the brilliant pastel colors of the White Domes. 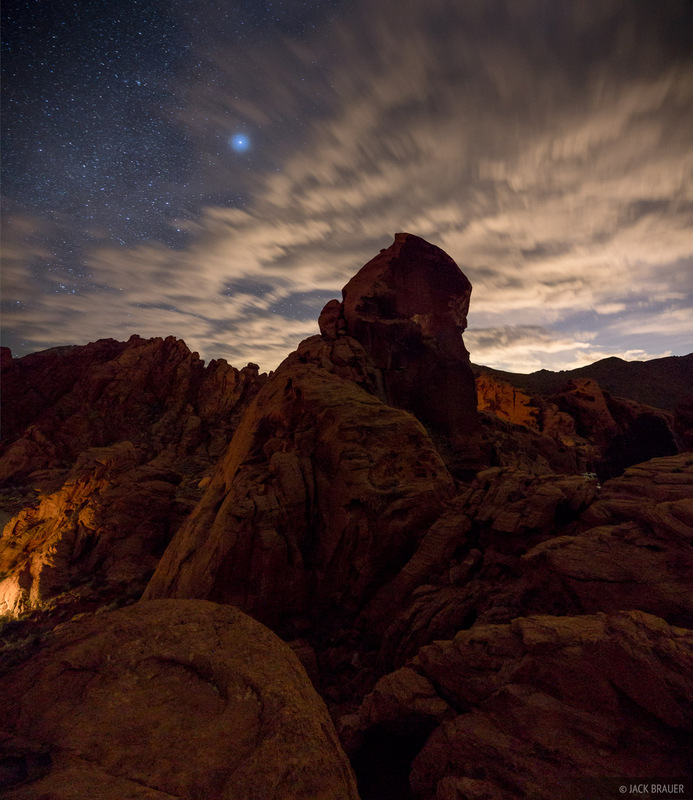 A nighttime view on the rocks above the campground at Valley of Fire State Park. The clouds are illuminated by the bright lights of Las Vegas. 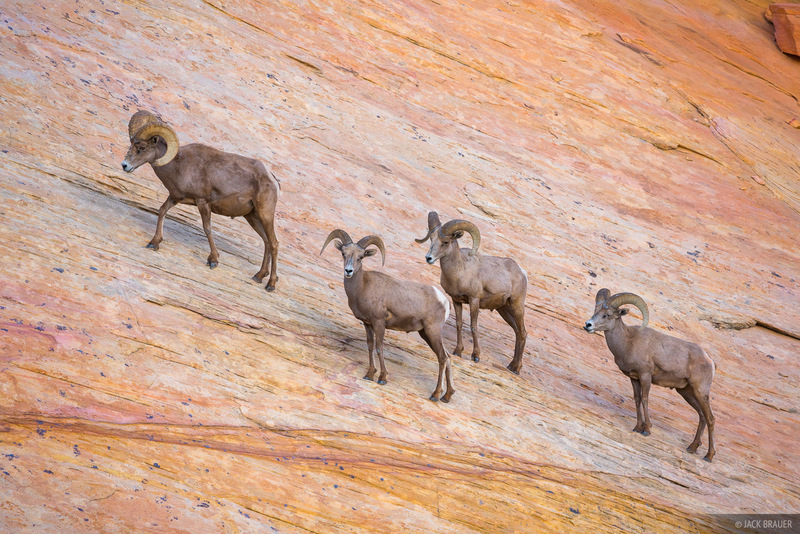 Bighorn sheep walk along the colorful sandstone of Valley of Fire. The White Domes Road goes between incredible sandstone formations. After a morning of photographing and wandering around the fantastic White Domes area again, we continued on to the neighboring Lake Mead National Recreaction Area. I get the feeling that this is a bit of an overlooked region; it's absolutely beautiful but there was almost nobody there except those just driving through the North Shore Drive. 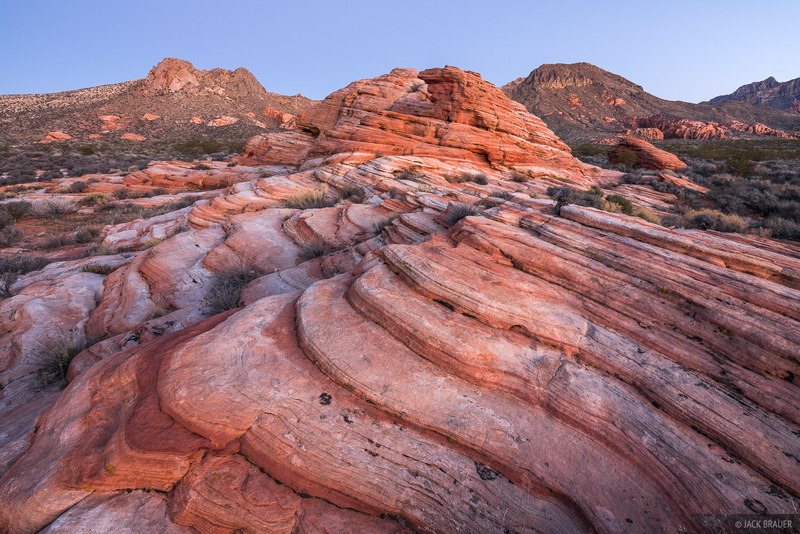 We spent several days camping in the area; one day we explored the Bowl of Fire, an area of rugged red sandstone formations similar to Valley of Fire. The next day we hiked up a random peak near the North Shore Drive summit offering an incredible view of the whole area including the Bowl of Fire and Muddy Mountains beyond. 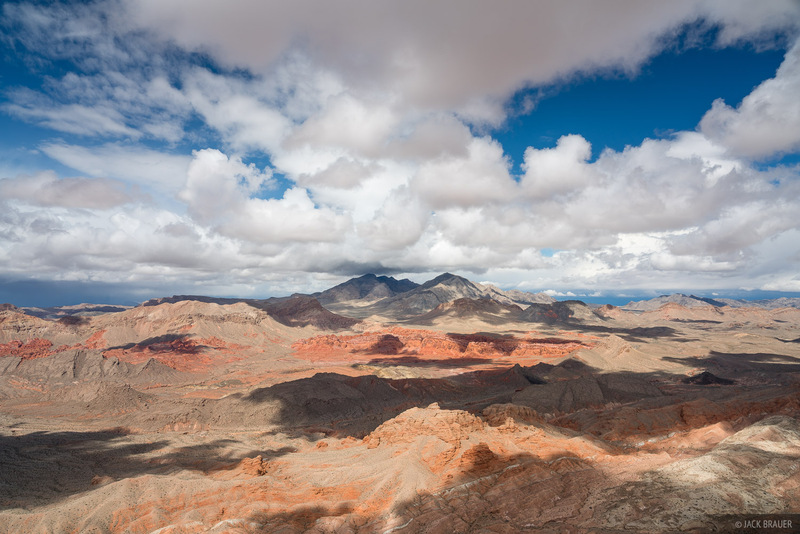 A view of the Muddy Mountains and the Bowl of Fire from a tall peak along the North Shore Drive near Lake Mead. Ominous clouds over the Muddy Mountains and Bowl of Fire. I really enjoyed this area and thought it was quite novel to be mountain hiking in the desert (rather than descending into canyons as usual during our desert adventures in Utah). I will certainly be returning here in the future to hike more desert peaks! Sunset light on slickrock in the Muddy Mountains Wilderness. We also explored a remote basin in the Muddy Mountains Wilderness which I had scoped out on the maps. I was surprised to find the basin full of sandstone outcroppings and of course we had to stay until sunset to photograph some of those. Twilight glow on some interesting sandstone in the Muddy Mountains Wilderness. 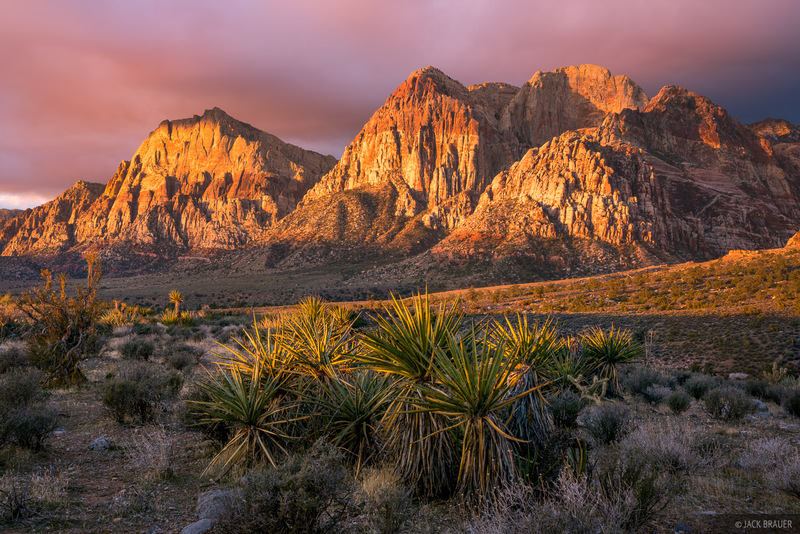 Finally we spent one night camping near Red Rock Canyon National Conservation Area which is just on the western outskirts of Las Vegas. These awesome sandstone peaks reminded me a bit of Zion. Though our backpacking and peak-scrambling plans there were dashed by frigid howling winds, I was stoked to photograph incredible sunrise light in the morning. Those of you who have been to Las Vegas know that it can be fun for a night or two but quickly loses its luster after that. But for nature lovers like us the surrounding deserts offer a lifetime of beauty and adventure! We only got a taste of it during our week there, but are eager to return for more. Posted in Canyons & Deserts and tagged Nevada.